Gal in the Middle: Unique Place to Keep a Pair of Handcuffs! Have you ever wondered wear plain-clothed police officers keep their handcuffs? I've never really thought about it, but I was at a kick-off event for the Indiana State Fair (still accepting entries for my ticket giveaway here) where Indiana Governor Mitch Daniels and Indianapolis Mayor Greg Ballard also happend to be on Friday and I noticed their security detail milling about. They didn't attempt to hide who they were and their guns were in full display on their belts. As they passed by me, I caught sight of their handcuffs and just had to get a photo. I used my camera phone to casually get this shot so it's not as clear as it could be. 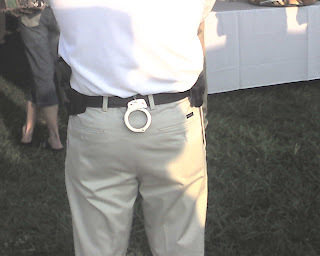 I snapped this photo of Off the Cuff and Indypendent at the fair on Friday too. 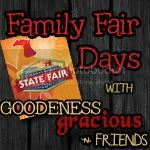 Now if the "Angels" had left money under the couch cushions, you'd have more to splurge with at the fair. Have a wonderful time, and don't forget to eat lots of cotton candy for me. 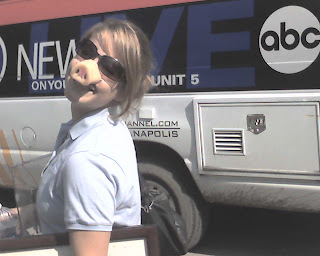 haha - so funny - glad we got to whip out the pig snouts!